Add the warm water to the yeast and soak 10 minutes, slowly mixing it with a fork. In a bowl, mix yeasty water and milk. Then add the sugar and salt, and the beaten egg. Add 1 cup of flour and mix very well with a fork. Add the remaining cups of flour adding one at a time, beating well after each addition. By the third or fourth cup, dough is dry enough and fluffy, to be mixed by hand. Let dough sit for 1 hour in a warm place. Work the dough into a ball, removing excess bubbles. Sprinkle flour on a large wooden surface and flatten the dough as thinly as possible, into roughly a rectangular shape. Use a flour-sprinkled wooden roll (or a wine bottle!) to roll it out thin. Melt about 12 to 16 tablespoons of butter at the microwave in a cup (slice it small first, and carefully don't let it boil), and mix it well with 500 g of brown sugar. Spread the sugar and butter mix over the thinly spread layer of dough with the help of a spoon and lots of patience. 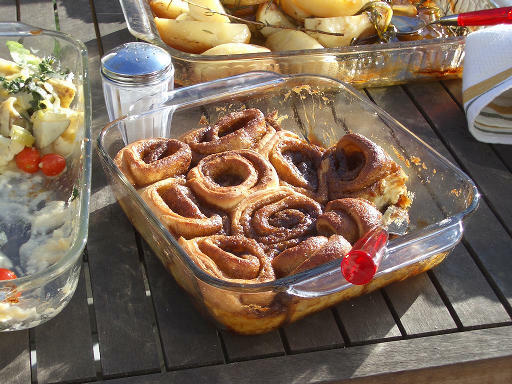 Sprinkle cinnamon, as much as you want, and add raisins (optional). 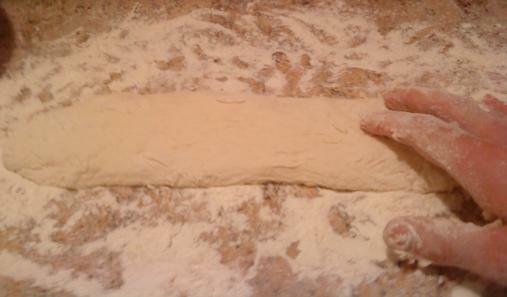 Roll the dough from the longer side and seal it with the hands, so it becomes a cylinder. With a large blade knife, cut small rolls, of about an inch thick, and place them into lightly buttered non-heated oven trays. Make sure the rolls nearly but not quite touch each other, so they have room to grow more. 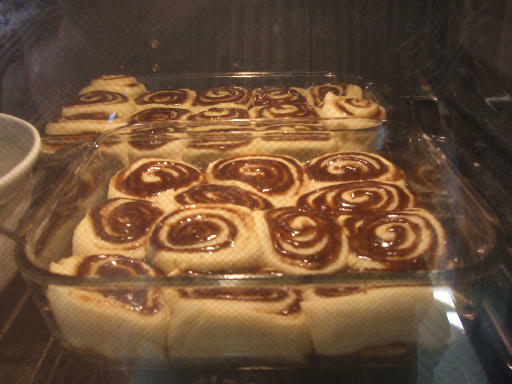 Let the rolls sit in a warm place 1 h. At the last 15 min, pre-heat the oven to 350 degrees Fahrenheit. Bake the rolls for 15 to 20 minutes. DO NOT overcook the rolls a single minute. They are done when they look a bit brown on the surface. If they get brown before 12 to 15 minutes have passed, next time use an aluminum foil on top. Let the rolls sit for at least 10 minutes (if you can wait!) or you'll burn yourself with the sugar. Place sugar, butter and vanilla in a bowl, and then stir in enough milk or cream to reach a thick, hardly-able to stir consistency. Spread the frosting over warm rolls as soon as they are placed on a plate to let the frosting melt and run into the rolls. Thanks to Kevin & Claire and Arnim for sharing their wonderful kitchen. It's a pleasure to cook with and for you! Pour the flour into a bowl through a colander, to sift it. While not necessary, it makes fluffier pancakes. Add the backing powder and salt, and stir a bit with a fork. Beat the eggs in a glass measuring cup, then add milk until the 1 cup mark. Pour into the bowl and mix all ingredients. If the batter is not runny enough, add more milk, up to about an additional half a cup. Warm up a non-sticky pan or pans to about 1/3 to 1/2 fire. For each pancake to make, put a tiny (tiny!) bit of butter on the pan, and then a large scoop of mix. The batter should flow for a bit, forming a nice round pancake. Make them small, placing up to 4 simultaneously on a large pan. Cook until the mass has bubbled a bit and can be lifted with a spatula or fork (the underneath is solid), then flip and cook the other side -warning: the other side will cook faster. Cooking time is about a minute for each pancake. The tiny bit of butter will prevent the pancake from sticking to the pan, and also give it a nice brownish coloration. Keep the pancakes under a lid to keep warm until eating. Serve with butter, marmalade, honey, maple syrup and/or chocolate on the side. Warm up the milk to about 37 degrees, and dissolve the yeast in it. Beat the 2 eggs in a bowl. Pour both the milk and the eggs into a big bowl, mix with a fork, and then add a single cup of flour. Mix well. Add the three melted tablespoons of butter (melt them by warming them up in the microwave, carefully not letting it boil), and add the 3 tablespoons of sugar. Mix well. Add one cup of flour at a time, mixing very well before adding the next. Do the mixing with a fork, for the mass is initially very wet. Let the mass sit in a warm place for 40 to 60 minutes. Mix the mass again, this time with the hands, removing excess bubbles. Whiten your hands with flour first to prevent the mass from sticking to your fingers and palm. Take a non-heated oven tray, preferably glass, and paint it all with a chunk of butter. Spread a bit of flour on a flat surface, such as a wooden table. Take a handful of mass, make a ball with it and flatten it out a bit into an ellipse. Put a small chunk of butter (like half a teaspoon) on it, and some pieces of broken black chocolate. Roll the ellipse to make an elongated shape, which you must seal by pressing the long sides together strongly and smartly, creating a crest, so that it does not have any holes from which butter or chocolate may scape once melted. These are your brioche. Put the brioche on the buttered tray, careful to leave a bit of space between them. They will grow to touch each other, leaving nice, moistly sides once baked. Let the unbaked brioche sit in a warm place (a bit over room temperature) for 30 to 60 minutes. Spread a bit of sugar powder on top. Help yourself with a spoon and the fingers. Bake for 25 minutes at 380 degrees in a pre-heated oven. Pour the first cup of warm water (baby-milk warm) into a large bowl and then two teaspoons of dry yeast. Stir with a fork until the water is mud murky. Pour one cup of flour and mix well with the fork until the mass is homogeneous. Mix the salt with the remaining cup of water and pour it into the bowl. Add the second cup of flour, mix well until homogeneous. Repeat with the third cup. Let the mass sit in a warm place for one hour or until it doubles in volume. Cover the bowl with a kitchen towel, or a plastic film. If you lack a warm place, switch on the oven for two minutes, open the door, make sure it's not too hot--sense the air--and leave the bowl there. After mass has grown, prepare two oven trays (pyrex glass works great) and smear butter all over it, walls included. In a clean surface, pour a few handfuls of flour and spread it with both hands. Make your hands white with flour and grab about half of the mass from the bowl, and drop it onto the floured surface. The mass will be very sticky; the flour in your hands will prevent the mass from sticking to your fingers. Sprinkle the mass with flour so that your hands don't stick to it, and stretch it a bit. Then fold the right third onto the center, and the left third on top of it (see pictures). Sprinkle more flour if too sticky. Push down gently to flatten the mass and stretch it again, and fold again. Repeat the folds 3 or 4 times total. Then place the mass on the buttered container, and store in a warm place for one hour or until it doubles in volume. Repeat with the remaining mass. You'll get two bread loafs. Once the folded mass has risen, dump it onto the floured surface and fold again 3 or 4 times. Then put it back onto the buttered container. Let the folded blobs rise for a third hour. 10 minutes before the end of the third hour, switch on the oven at 450 degrees Farenheit. When the oven is hot, bake the bread for 25 to 30 minutes. Be sure to remove any trays the oven has inside, and to place the grid at about half height. Baking 25 minutes is usually enough; the bread may start smoking, getting a nice dark crust. 2 cups of white flour (King Arthur all-purpose white flour, the red and white package). 1 cup of "Bob's Red Mill organic whole grain high fiber hot cereal" (it's quite a mouthful!). It's a mixture of grounded oats, flax seeds, oat bran, wheat bran and wheat germ. Put the warm water and salt in a bowl and stir to dissolve the salt. Add the yeast and stir with a fork until homogeneous. Then add one cup of white flour and mix well with a fork. Add the olive oil and stir until homogeneous. Add the second cup of white flour and stir again until homogeneous. Add the cup of mixed cereals, mix well, and let it sit in a warm place for at least 1.5 to 2 hours. Then, mix with a fork and add small increments of white flour (about one or two tablespoons) until the mass stops being wet and detaches itself from the bowl; in the process, when it starts getting dryer, stop mixing with the fork and knead with your hands and fists by folding the mass in two and pushing it flat. Split the mass in two pieces and make elongated loafs, to be placed on buttered pyrex glass platters. Let it raise for 1 to 2 hours in a warm place. Pre-heat the oven to 375 degrees farenheit and when ready, cook for 50 minutes. Look at it at the 30 and 40 minute mark--not all ovens are equally strong. 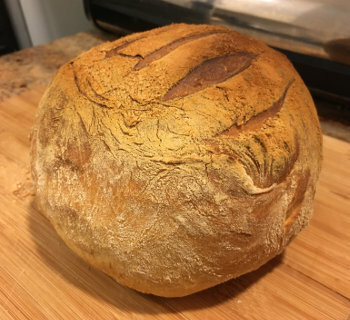 The bread is done when it looks golden and crusty, and sounds hollow when banged with your knuckles. In a large bowl, beat the egg and then add the milk and the salt. Then add the flour and the baking powder and mix well with a fork. In the microwave, melt 0.5 cups of butter. Then add it to the mass and mix well with the fork. Choose a glass container and butter its walls so that the cake won't stick. Choose a container so that the mass will fill up about one third. Put the mass in the oven for 45 minutes at 350 degrees Fahrenheit. 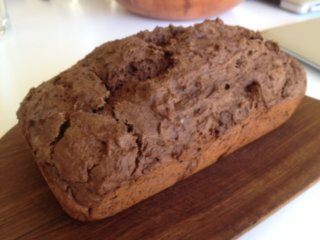 When done, take the cake out of the oven and wait 10 minutes for it to cool down prior to removing it from the container. To take the cake out of the glass container, gently turn it around over a wood, and, if a bit stuck, cut with a knife between the cake and the glass walls. Let the cake cool down for at least 15 minutes. when the cake is cool, take a knife with a long wide blade and cut it horizontally. Spread a thick layer of peach marmelade. Close the cake again. While the cake cools down, break the black chocolate tablets into smallish pieces into a pyrex glass bowl; add the other 0.5 cups of butter (cut it into pieces) into the bowl as well, and melt together in the microwave. Stirr frequently to avoid burning the chocolate or boiling the butter. With the help of a spoon, paint the whole cake generously with chocholate, with care to cover every side. Clean the strawberries and put some of them on top. Others, cut in half and put on the sides, sitting on the wood where the cake stands. Melt the white chocolate in a glass bowl in the microwave, with great care becase it may burn easily (it has a lot of sugar). With a fork, draw figures with the while chocolate over the black chocolate cover and the strawberries. Pour the flour in a bowl and mix in the salt and baking powder. Then add about half of the sugar, the milk and the egg and mix it all with a fork until homogeneous (will take you 3 minutes). Then grate the skin of the lemon directly onto the dough and mix it. Prepare a pyrex glass container by painting butter with your hand all over it, to prevent the mix from sticking when cooking. The contaienr should only be half full with the mass when poured in. Pour the dough. Peel the apple and cut it vertically in pieces similar to the individual pieces of an orange. Place the apple pieces on the surface of the mass, arranged carefully, and push them in so that they are fully, or almost, covered with dough. Sprinkle the remainder of the brown sugar on top of the dough and apple pieces. Cook in the oven for 45 minutes at 300 degrees Fahrenheit (about half oven power). 30 minutes in take it out and dip a sharp knife at the center and make sure the cake is not cooked already. Not all ovens are the same. 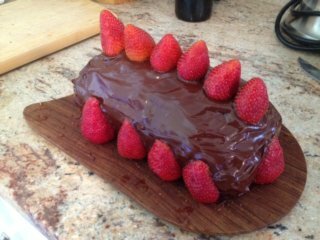 Once cooked, take the cake out of the mold with the help of a blunt knife and, if it got stuck at the bottom because you cooked it too much, help yourself with a fork (taking advantage of its curvature) from the sides to separate the cake from the mold. I prefer to eat it with cold yogurt on top, or with butter. 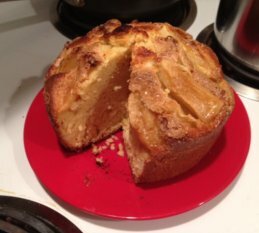 The cake can be done as well with cherries (cut them in half and take out the pit), pears, or banana. Smash the banana with a fork on a plate, and mix all ingredients except the chocolate in a bowl. Prepare mini-muffin paper cups on 2 trays, and use a spoon and a fork to place some batter in each. Then dip a chocolate chip in each muffin. Cook for 23 min at 400F (prewarmed). Mix the batter ingredients and let it rise for 1 hour, in a container covered with film to avoid desiccation (or cover with a lid, if tight enough). Mix again and let rise 30 min. 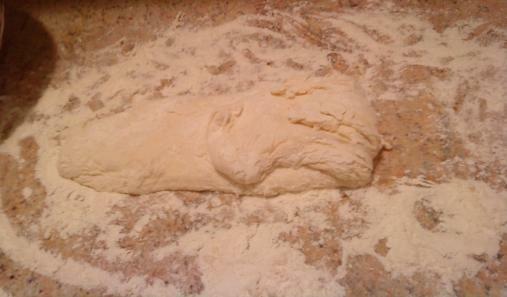 Mix again and roll out flat, with some flour on the surface to avoid the mass from getting stuck. Paint with 2 melted tbsp of butter plus 1 tbsp of brown sugar. Roll the mass, slice into 2 inch pieces with the help of a large blade knife, place rolls on buttered glass container. Let rise for 20 min, covered in film. Preheat the oven to 350 F, cook for 20 to 25 min: they are done when they turn a bit brown. Place the rolls on a wooden board and let them dry and cool for about 30 minutes. Mix 1/2 cup of minced walnuts with 1/4 cup of melted black chocolate and 1 tbsp of butter; melt first the chocolate and butter in e.g. a microwave (about 40 seconds). Spread warm on top of the baked rolls when serving. 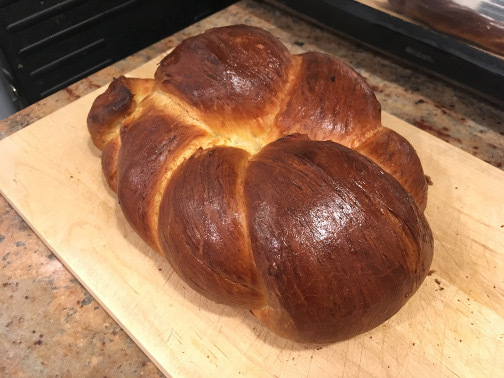 This butterzopf recipe comes out like milk bread. Has the external appearance of a butterzopf and tastes quite good, but lacks the croissant-like elasticky crumb. If you want the latter (you do!) check out the next recipe instead. Mix the flour with the yeast, sugar and salt, and stir. Then add the milk and melted butter, and place in a kitchen robot that can knead the dough (too dry to do by hand effectively with a fork). Let rise for 1 to 1.5 hours, sealed with film to prevent desiccation. Smash the dough with your hands and split in two. With each half, make as long a roll as you possibly can (it's very elastic). Then braid the two rolls together. There should be 5-6 steps of the two rolls crossing each other. Place on a buttered glass container and let rise for about 30 minutes, covered in film to prevent desiccation. Pre-heat the oven to 220C (430F). Beat the egg in a bowl, and mix in half a teaspoon of brown sugar (optional). 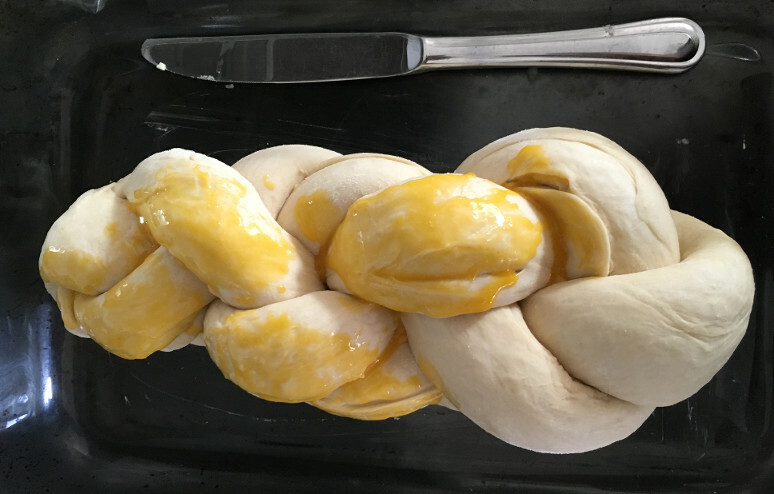 Paint the now enlarged braided dough; will use up about 1/3 of the egg. Cook at the lower part of the oven for 40 minutes. Pour the milk, salt, sugar and beaten egg whites into a bowl for machine mixing (I use a Kitchenaid), and stir for a minute. Stop the mixing, then add about half the flour and sprinkle the yeast on top, and mix well until the rather liquid batter is homogeneous. Stop the mixing again and add most of the remaining flour and 60 g of melted butter (20 seconds in the microwave does it). Mix well. If the dough is too sticky, add the remaining flour bit by bit until it isn't. Most days you'll use all of it. Transfer the dough into a very lightly oiled or buttered bowl and cover with a large lid or plastic film wrap. Let it rise for about 2 hours (at the very least for 1 hour) in a warm place. I use the stove top itself, which has a warmer unit, by switching it on for 5 minutes on low (more, and you risk cooking it). Butter a glass tray into which the braided dough will grow and bake, in advance so it is ready. 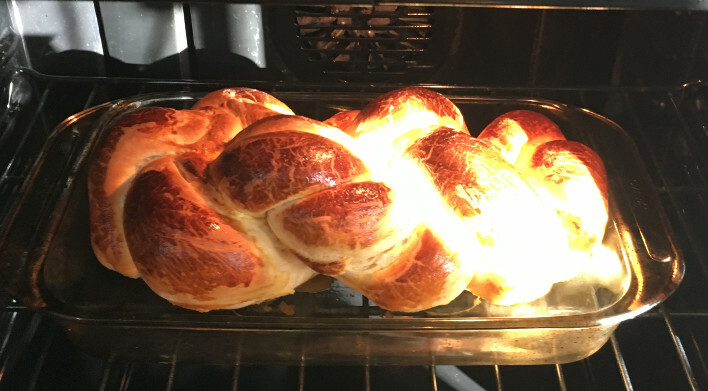 Make sure you pick a large tray: the braided loaf will grow to about 3 to 4 times its starting volume. With the help of a sturdy spatula or with your hands, separate the now grown dough from the bowl's walls--should come out easy--and knead it lightly to remove large bubbles. Split in two. With your hands make a 20-inch long string from one of the halves and place on a large, lightly floured surface. Use a baking wooden rolling pin (or a clean bottle of wine, when visiting non-baking friends), lightly floured to prevent the dough from sticking to it, to flatten somewhat thin, more like for a pizza than for croissants. First flatten by using the rolling pin perpendicuar to the string (which will also make it longer), then parallel to thin it. Then with a cooking brush (or your fingers) paint the flattened dough with about 10 g of melted butter. 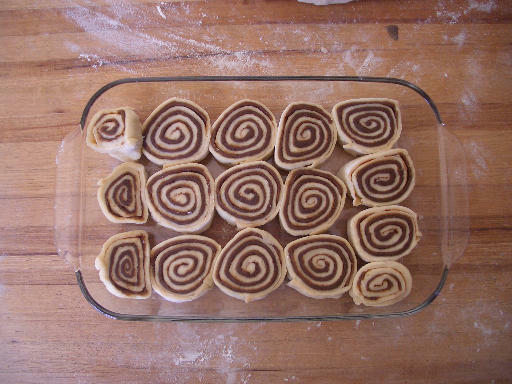 Now roll it back, as if you were making cinnamon rolls, and pinch the edge onto the mass to seal it. Repeat with the other half of the dough. This step is essential to get that soft, threaded texture of the butterzopf loaf, more reminiscent of a butter croissant, as opposed to regular bread crumb. Braid the two rolls and pinch the ends together to keep them in place. Transfer to the ready buttered glass tray, and paint the top generously with the beaten egg yolks (which you've kept in a cup in the fridge all this time). You'll use about half of the yolk paste. Place in the cold oven in the lower shelf and switch it on for 2 minutes to warm it up a bit, then switch it off and let grow for about 15 minutes. Will double in volume. Don't let it grow too much or you risk that it flattens and loses its shape. Switch on the oven to 430F and cook for 35 minutes. My oven takes about 8 minutes to reach 430F when starting cold--factor that in. If it sounds hollow when hit by the side of a fork it is done. The crust will look dark brown. When in doubt leave for another 5 minutes; if it was already done it will become a bit more crusty but it won't burn. Take the butterzopf loaf out of the oven and gently help it become unstuck with a curved fork (the dripping egg yolk is to blame). Let it cool down on a wooden board for 10 minutes. Enjoy your warm and deliciously smelling and fluffy and buttery and tasty butterzopf! Despite how large the loaf is, hardly any will survive 'til the next day. Mix all ingredients. Easiest with a kitchen robot arm. Spread with your fingers some droplets of olive oil on a bowl to prevent the dough from sticking, make a nice round ball with the dough and put it in. Cover with plastic wrap to avoid desiccation. Let grow for anywhere from 50 minutes to 1.5 hours in a warm place. Make a ball with the dough, smashing away bubbles. If it sticks to your fingers, add a couple of tablespoons of flour, kneading the dough over it. 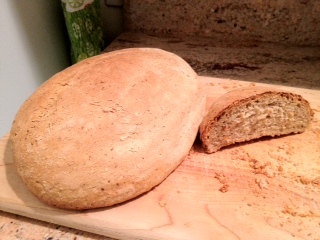 It has to be dry enough--but not crumbly--so that the bread loaf you are about to make will hold its shape. 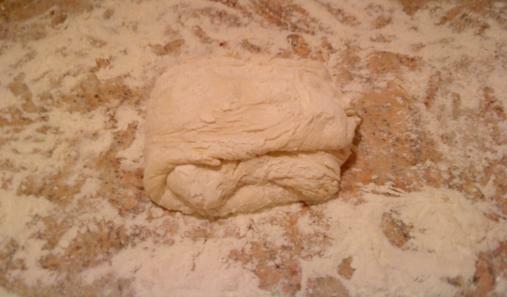 Flatten and stretch and fold the dough like for ciabatta bread, 3-4 times. Make cuts on the surface to allow controlled stretching as it grows on the glass tray for the next 20 to 30 min in a warm place, again sealed with wrap. Cook for 25-30 min at 450F in a preheated oven. The loaf should sound hollow when hit with the side of a fork. 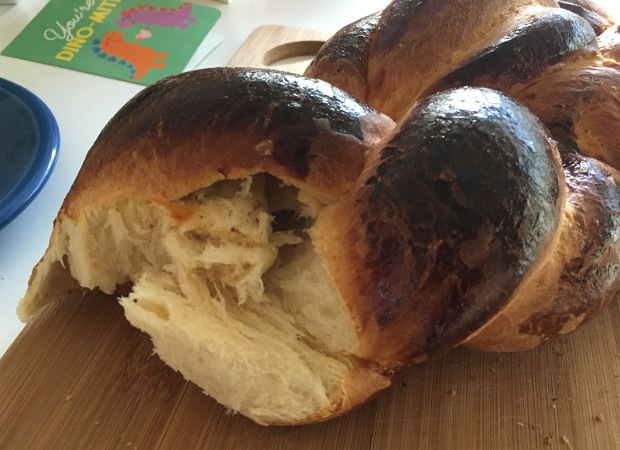 Not the usual breakfast bread. 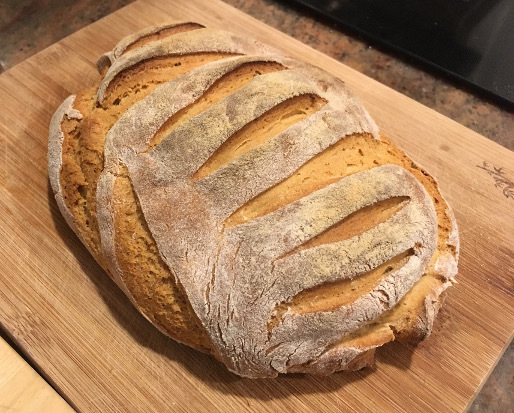 Instead, an excellent bread for a meal of e.g. asparagus omelettes or potato and onion omelettes. Aromatic and delicious, and crusty, with a delightful aftertaste of spice. Note: contains gluten, despite using also glutten-free flour. Mix the salt and water, then in a kitchen robot (or by hand with a fork) stir in the white flour and then the yeast. Mix well. Now mix in the other flour--which adds an excellent taste that reminds me of delicious breakfasts I've had in Rajasthan, India)--and the olive oil. Smear a few droplets of olive oil on a container and transfer the dough into it, where it will sit for upwards of two hours in a warm place, until it more than doubles in volume. 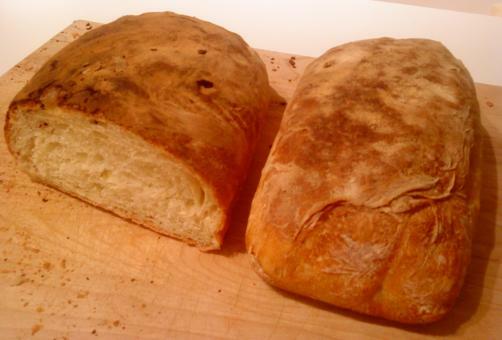 Shape into a bread loaf by removing the bubbles and folding like a ciabatta bread loaf. Will need some flour to make it drier and therefore harder, so that it keeps its loaf shape as it grows in a warm place for the next 30 minutes. Bake at 450F for about 25 minutes. The loaf will sound hollow when hit with the side of a fork, and the crust will be solid and brown. Last updated: 2019-03-03 11:41 New York time. Copyright Albert Cardona.